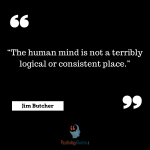 Psychoanalysis is a set of psychological and psychotherapeutic theories and associated techniques, originally popularized by Austrian physician Sigmund Freud and stemming partly from the clinical work of Josef Breuer and others. We cannot selectively numb emotions, when we numb the painful emotions, we also numb the positive emotions. Psychoanalysis is confession without absolution. People who do not understand themselves have a craving for understanding. 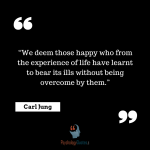 Fortunately analysis is not the only way to resolve inner conflicts. Life itself remains a very effective therapist. Fortunately analysis is not the only way to resolve inner conflicts. Life itself remains a very effective therapist. 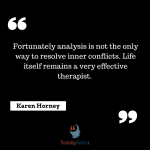 ~Karen Horney, Our Inner Conflicts.